Are you greedy? Are you cunning? 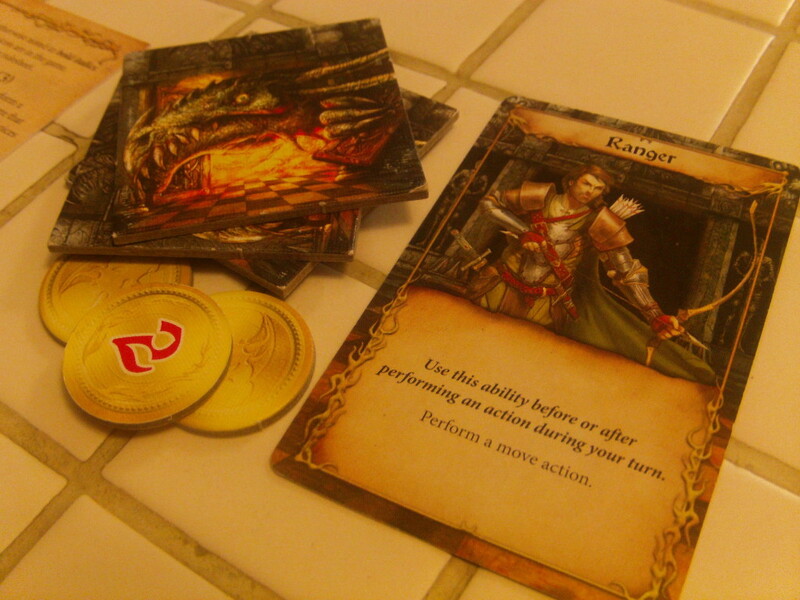 Are you willing to shove past fellow adventurers in an effort to scrounge whatever gold coins you can? You had better be, because if you aren’t willing to do whatever it takes to fill your purse with gold, you shall be devoured by the magnificent and terrible Drakon the dragon. She stalks the halls of her labyrinth, feasting upon any adventurer who would dare steal from her gleaming hoard. 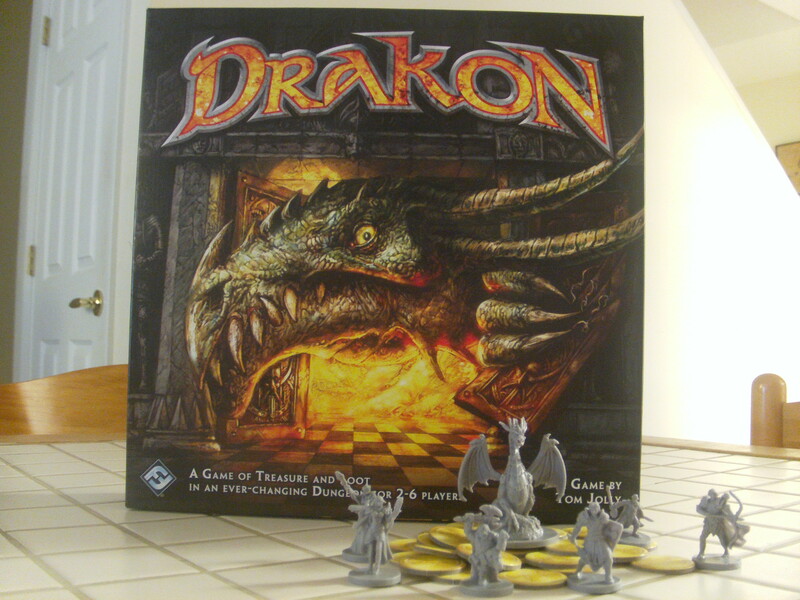 This is the situation in which you find yourself in Fantasy Flight’s Drakon- a tile laying game for two to six players in which games last typically 20-30 minutes. This is the fourth edition of this game that has been published. So, in this game, each player takes on the role of an adventurer (either a Fighter, Thief, Knight, Ranger, Sorceress, or Druid) who is each competing to collect a total value of ten gold coins. The first to do so wins and escapes Drakon’s labyrinth- the rest are devoured by her. Sounds fair enough, right? On each player’s turn, they will either play a tile from their hand (attaching it to the labyrinth) or they will move their character into a chamber adjacent to their current location (following an arrow printed on the tile on which they’re standing.) Most chambers have a symbol in the middle of the tile and this symbol means that there will be an effect on either an adventurer entering it, exiting it, or placing it. Some of these effects are beneficial, such as allowing the adventurer to pick up a coin, or steal a coin or tile from another player. Other tiles can cause chambers to be rotated, moved, or removed altogether. Some chambers might even cause the adventurer to lose a coin- there are 17 different types of chambers and 72 tiles in all, meaning the possible layouts of the labyrinth are nearly endless. Of all the chambers, however, the most fear inducing must be Drakon Moves. 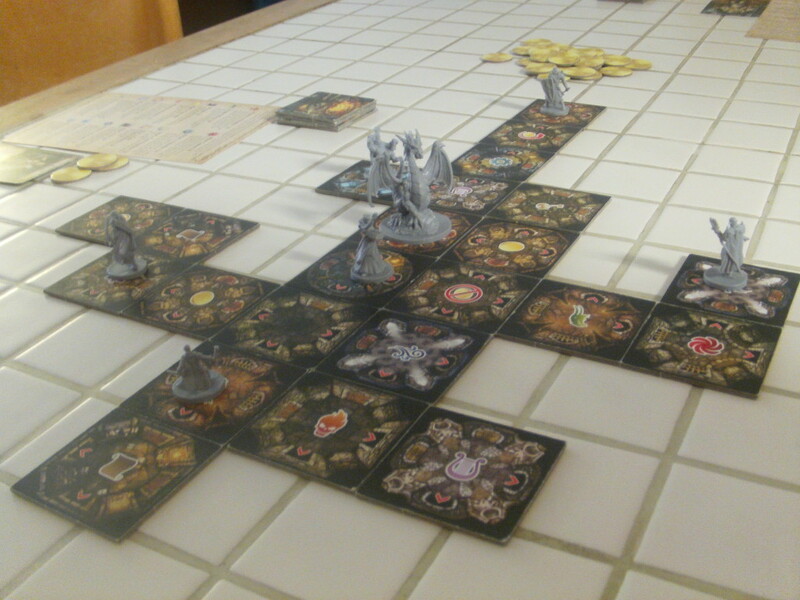 When this tile is added to the labyrinth, Drakon herself is added to the board. Whenever a player enters another chamber with her symbol, they can move Drakon up to three rooms, ignoring any arrows or symbols. If Drakon finishes her move in the same chamber as any unlucky adventurers, they’ll be sent back to the entrance of the labyrinth and lose a random coin. You see, coins are what it’s all about in this game. Each time an adventurer receives a coin, they will add it to their collection. Each coin has either a one, two, or three printed on its back. If you can get your total value to ten, you instantly win the game. This means that since the value of each coin is kept secret, players will be warily eying each other’s stacks of coins and plotting where to place tiles to best mess with each other’s plans- and not only the strategic use of Drakon, but the utilization of arrows play heavily into this. You see, players can only move into rooms following the arrows printed on the tiles- and since tiles cannot be placed with arrows pointed at each other, an adventurer can never simply go directly back to the room from which they came. The result of this is that players will place rooms not only next to the room in which their character is located, but rooms with negative effects next to their opponents. And the variation doesn’t just stop at the amount and combinations of the tiles. There is a Heroes! 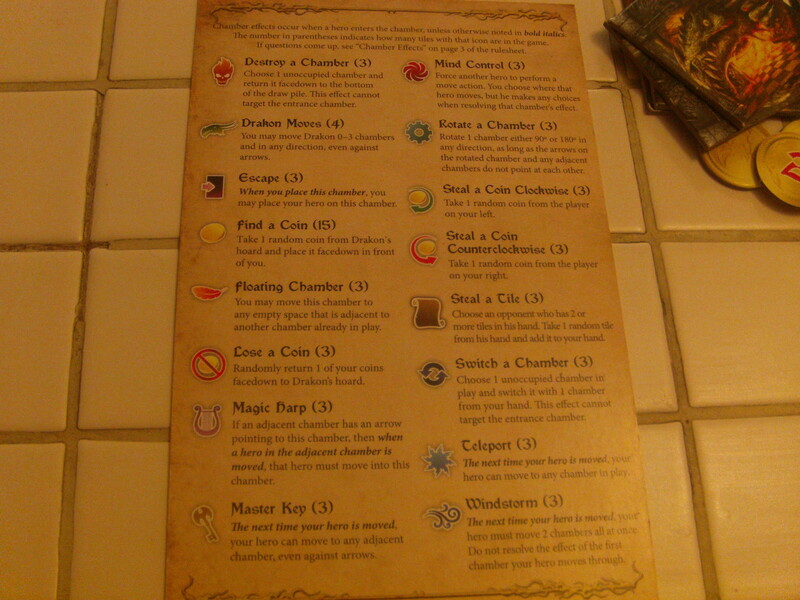 variant in which each adventurer has a special ability they can use once per game. 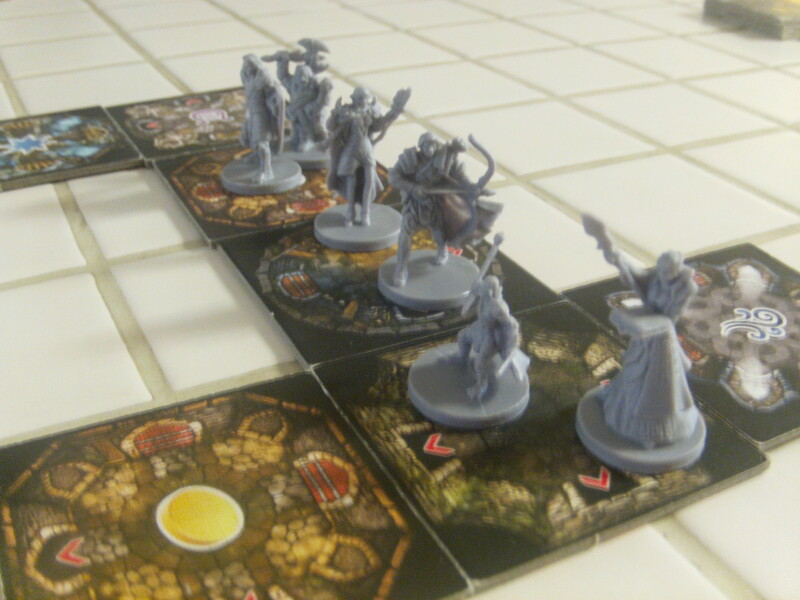 There is a Team Play variant, in which adventurers are separated into teams of two, with each team pooling their coins and working toward a value of 20 gold. There is an additional variant called Escape from Drakon’s Lair! in which adventurers must only collect a total of eight gold, but in order to win, they must make their way to a chamber with either an Escape or Teleportation symbol, giving the other adventurers a chance to possibly get the last few coins they need and beat them to it. 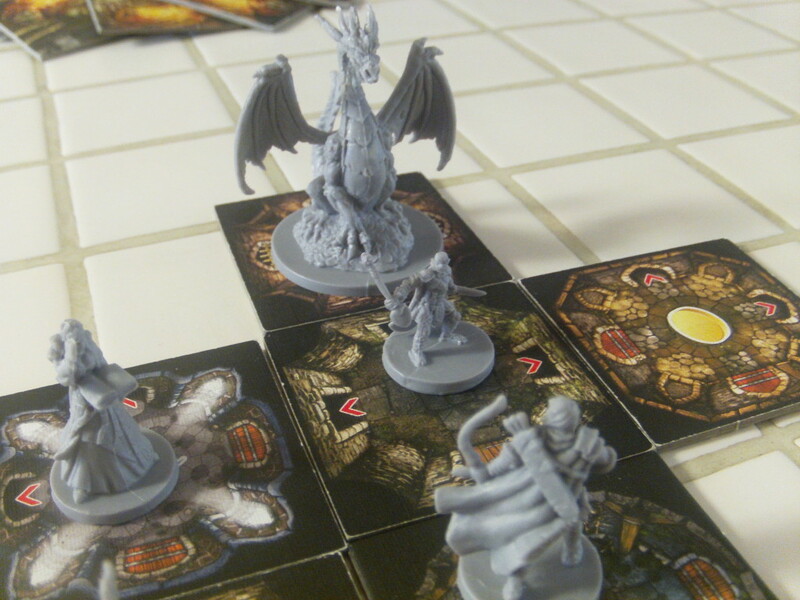 So, Drakon turns out to be fun little game with a veritable dragon worthy hoard of replay value jammed into such a small box. It’s a nice game with light strategy woven throughout it and a perfect choice to play with beginning gamers. What’s more, the miniatures included are highly detailed and paintable, too- so one can really make the game their own through some customization and application of paint. All in all, Drakon is a great little game for those who want a lot of bang for their buck this holiday season, so A Space Ahead heartily recommends you try this one out and see what you think.